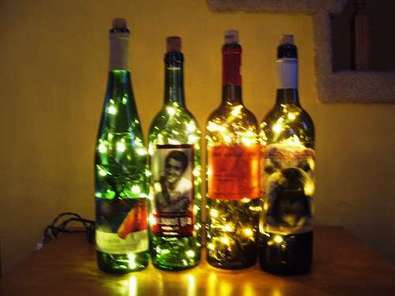 What do you do with your leftover wine bottles? Do they make their way to the uninspired recycle bin awaiting their fate in a fiery furnace? Maybe you’re like me and save a few of your memorable bottles and they adorn the tops of your kitchen cabinet. I still have the bottle of wine that we were drinking when I proposed to my wife. Sometimes I save bottles just so my wine rack doesn’t look so defeated. Many bottles are beautiful works of art and that glass has to be useful for something other than being reincarnated as…gasp…a beer bottle. 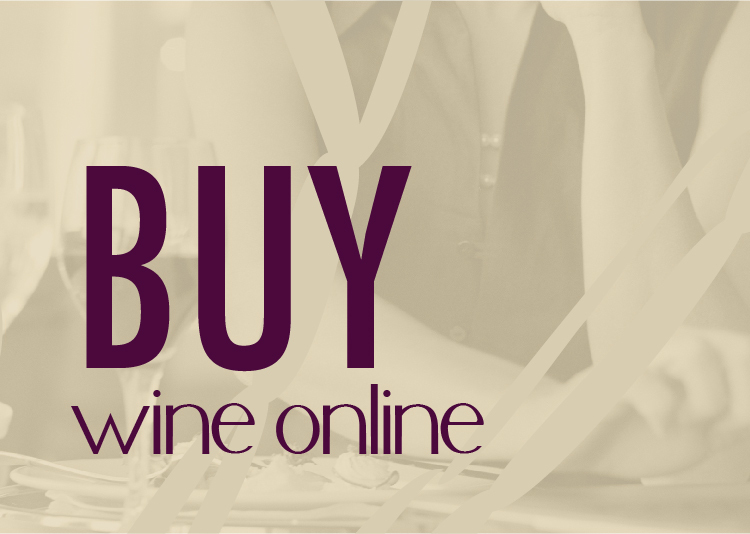 Here are 7 creative uses for your wine bottles. I would love to hear of anything fun that you do. Please share in the comments if you’ve done any of these or if you have other inspiring ideas to share with the readers here. 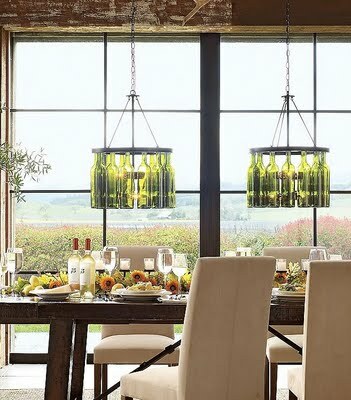 Not only is it hip to go ‘green,’ the wine bottle makes for an elegant decoration. 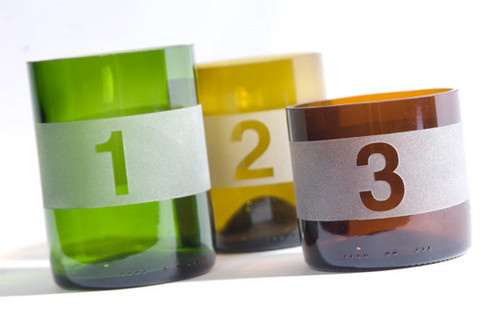 Creative angled cuts with a glass cutter and you have yourself a decorative vase. 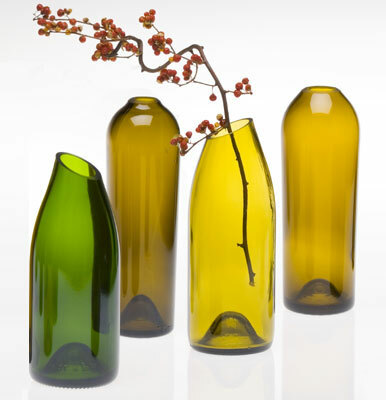 A simple cut with a glass cutter and some edge finishing gives new life to wine bottles. A few simple items from the hardware store, some premade ceramic wine glass torch toppers, and some fuel and you have yourself a creative outdoor torch. Cut a hole in the bottom, fill with a short strand of Christmas lights and you have yourself a fun lighting solution. This industrious crafter could build a unique lighting solution that is sure to be a show stopper and conversation starter. 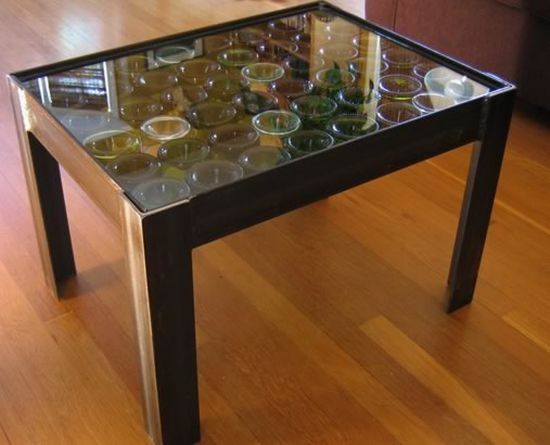 Take an old glass table top and add wine bottle punts for some new artsy loft flare. 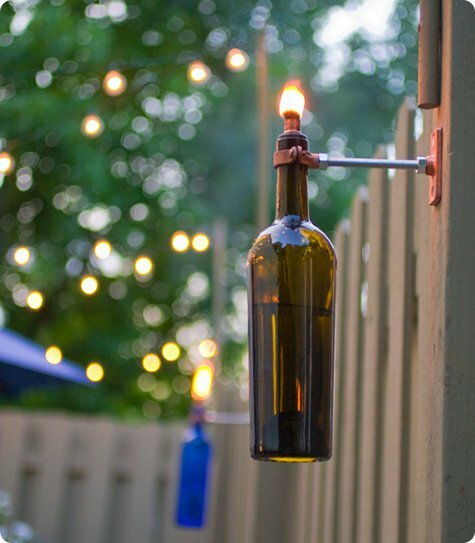 An alternate take on the outdoor lamp, use some ordinary hardware items to create a work of wine wall art . 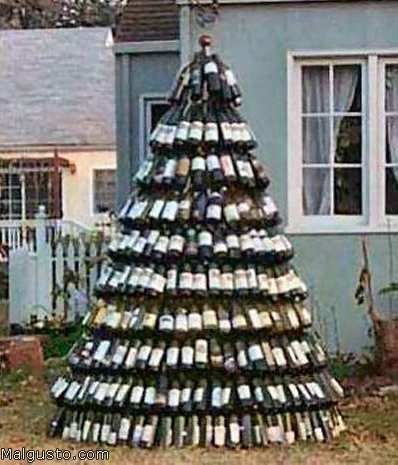 This Christmas tree is made entirely of wine bottles. I bet there was a severe hangover after that party! Neat blog, Josh, I love all the photos. We haven’t thrown a wine bottle away in the two years we’ve lived in Washington. That means have about, oh a dozen or so empties. One use we’ve come up with so far, recycling with homemade wine. A couple hundred have seen that cruel fate and some of them are now on their second trip through the recycle bin, er, closet. My next idea is to build a cellar wall out of bottles stacked on their sides punt side into the cellar and bottles recorked to create an air insulated wall. Some construction kinks to work out, like how to mortar and how to hang things on that wall but it might happen this winter. It does take a boatload of bottles to build a decent size wall that way though and if I get to the point of actual construction I’ll probably scour tasting rooms for more empties. Chris that sounds like a fun adventure. 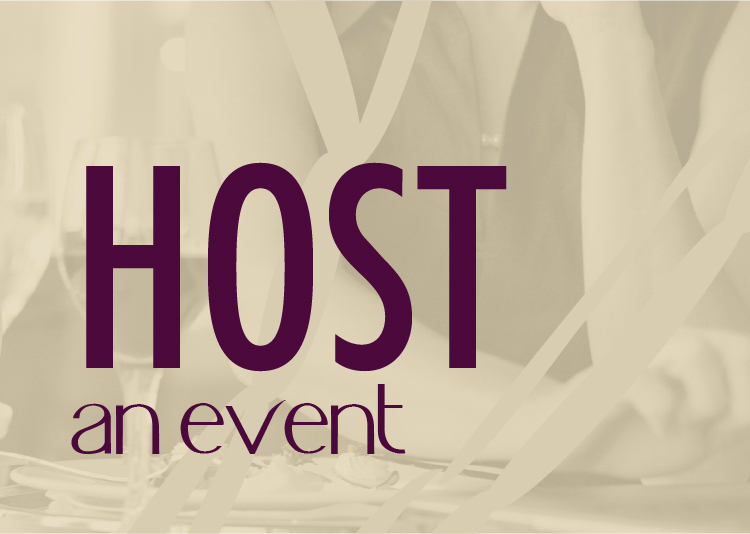 Sadly, you’ll need to drink more wine! Share some pictures through twitter/facebook when you get around to constructing! that 6 a year thats one bottle ever other month. Thats sad. Anyway I think I have enough bottles to make that Christmas tree. I did not store them right. Any suggestions??? I use my “best” bottles as candle holders. The wine shop I frequent sells candle holders with a cork that fits into the bottle. The top part has a holder for 1, 2, or 3 candles. Very nice. Mine are black iron (or something like that) with the 3 candle holders. next time don’t throw the wine out…make your own vinegar! Check out old Mother Earth mags. I mean old. I seem to remember walls being built like this. Pretty too! Josh – nice post. Some cool ideas in here. 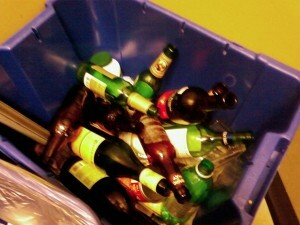 I’m right there with you about having a few significant empties around the house. The bottle my wife and I drank when I proposed is front and center on our mantle! Chris – that sounds like a really cool (yet challenging) idea. I echo Josh’s sentiments in wanting to see pictures if you do decide to tackle the project! Mike, what was the bottle you proposed with? These are all great ideas, Josh. Thanks for sharing them. I personally like the christmas lights in the wine bottles. Thanks, Frank! Looks like I need to invest in a glass cutter! I love the light fixture…breathtaking! HAHAHA! The Christmas tree has me laughing so hard I almost peed! Thanks for the smile Josh- great post, and very consumer friendly. Isn’t that crazy! Maybe we should try something like that this Christmas. Haha! They are pretty darn cool! Some look pretty easy…others…not so much. So how much is a glass cutter? you go, it will split without having to grind or sand it. Cheers. My husband’s grandmother used to do this with really large glass bottles, then used them as mini greenhouses over new garden plants in the spring. I tried several times one night just on ONE bottle to get it to cut with acetone & a lighter. It did NOT work for me! I went out & bought thicker yarn, so we shall see it that works. I am getting very frustrated with the entire project but I really want them cut into different heights so I can make arrangements as well as candle covers. I did make some with spray paint, mod Podge & Epsom salt that turned out great! I did stained glass as a hobby. Before dringing wine and building wine cellars out of wine bottles became my hobby. Anyway, that glass cutter Josh linked is similar to any glass cutter that might be used to cut stained glass. It doesn’t actually CUT the glass, it scores it along a continuous line, then when you tap the glass just the right way it breaks evenly along the score line. This takes practice with flat stained glass, I’m sure practice with this device and many trial bottles is needed too. Thanks for the great info, Chris! I’ve been doing a series of what to do with those excess wine corks. Awesome! Provide the link here so people can see what you’re up too! Here’s the first two links in our series of what to do with wine corks. And what is the best way to do the edge finishing after you cut the glass? From what I’ve seen a fine grit dremel tool (sp?) attachment or by hand. Back in the olden days of Gen Chem, when we had to fashion our own glass stir sticks, we rounded the sharp edges over a bunson burner. I’m sure an small butane torch would do the same. I love all the great pics and ideals for empty glass bottles. Especially love the Christmas Tree!! keep comming up with more great ideals. Thanks for the twine-burning-cut info! I’d love to see that “tree” lit up! Are there lights underneath? Would love more details on how to make the wine bottle torch! We are about to build a pergola in our back yard and it would be awesome to have those on the posts to light at night! Can you provide any details on what you would need? This is outstanding. Such creative and wonderful ideas. I love crafting of all kinds. Do you have a copy of this to mail? I can’t wait for Xmas gifts! I came across this blog today via Cavit’s post on Facebook. My mom moved back to Germany a few years ago and every time she visits the US I stock up on Reisling for her. I found a particular brand whose bottles have a picture painted on the back of the bottle and a ‘viewing window’ on the front of the bottle. She makes me save all of these bottles for her at my home in New Jersey and they are slowly piling up. I didn’t know what to do with all of them…until now. I’m going to visit her this Christmas and I’m thinking about making little vases out of them since she’s always picking flowers from her garden. Thanks for the idea. Great blog, by the way. How and what kind of saw do you use? If you are needing more bottles, the recycle center is a great place to find some! I go by there every day on my way home from work (it’s practically next door) and take all the colbalt bottles I can find! I use them (and other colors too) to make tumblers. A bottle cutter works great to score the glass. Then I use a flame from a candle to heat where I scored, run under cold water and it seperates into two. The string method works too, just not as well as scoring does. I then use a grinder on my dremel (or any rotary tool) to smooth them down and round out the edges. Final touch-etch designs on them! I use wine bottles to paint on for different occasions. Then put lights inside. I sell at craft shows. I especially like Christmas themes. I saw this on Pinterest this morning. Can you give me more info on where to get the supplies for the torches? I love all of these ideas, and some of your readers had some great one’s also. Very cool blog/site!!! I have a wrought iron hanging bottle tree on my patio in front of my hot tub (the sun shines through it giving off some brilliant hues), but that is about as creative as I have gotten. I’m inspired! Would love to know how you made the angle cuts for the flower vases? Same here! I love the angled cuts but can’t seem to even master the straight cuts! I’m thinking free hand. Dip bottle top in boiling water for 10 seconds then ice water for 10 seconds. Repeat until top falls off, then sand lightly. Remember to wear eye protection just in case. Had good luck with this method.